One Month In… | Becoming Star-Lord. So here I am, about 30 days in. I can definitely say that this project has been far more work than I imagined it would be when I started. I considered the time and money each piece would require to find, but didn’t think about the hours and hours I would spend customizing each item. The sanding, gluing, painting, sealing, etc. It adds up. The money adds up too. I doesn’t seem like a lot when each item is purchased days apart, but when I add it all together, and take into account the cost of crafting materials, the cost is significant. Quite significant. It’s a little stressful, honestly. However, I have to follow that sentiment with this one: all my backers have made this project worth it. I’m blown away by the generosity of all those who have donated to the campaign thus far. Every time I get a little stressed out by the work I have yet to do (and the money I’ve spent) thus far, I remember that together we’ve raised $1000 CASA over the last 30 days. That’s incredible. So, thanks to my donors, blog followers, and everyone who has supported me thus far. Let’s keep the train rolling! I recently purchased a few new items that I can’t wait to share with everyone. As soon as I get them, expect some awesome updates. Stay tuned and spread the word! 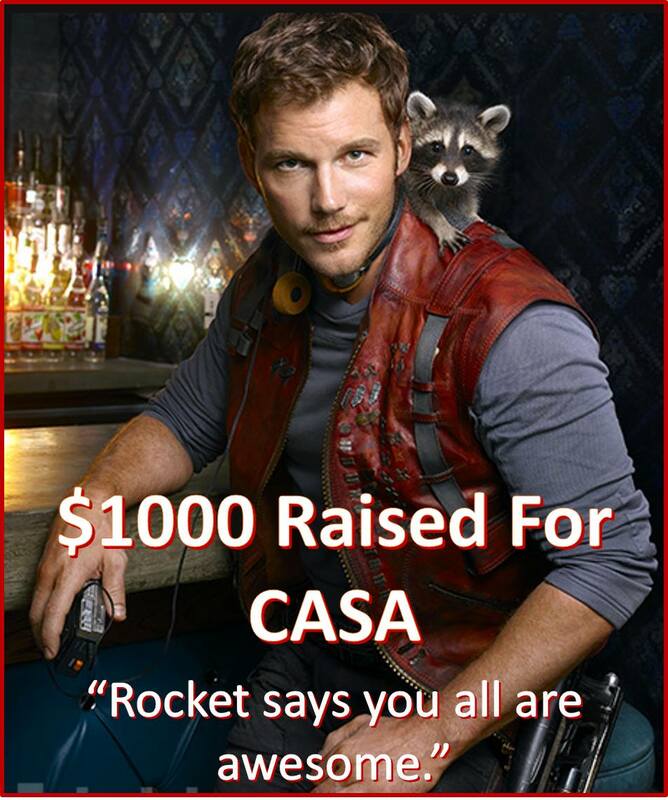 This entry was posted in About Me, Children in Need and tagged CASA, charity, Children, cosplay, costume, disney, guardians of the galaxy, non-profit, props, Star-Lord, Starlord, Superhero, toys on July 10, 2015 by Liam.